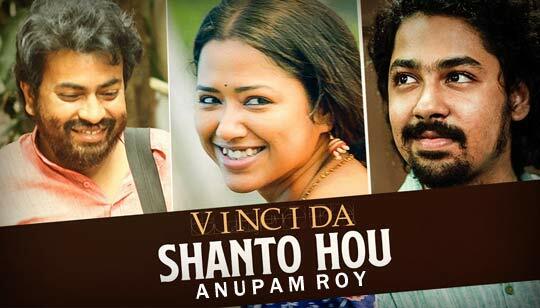 Shanto Hou Song Is Sung by Anupam Roy from Vinci Da Bengali Movie 2019. Music composed by And Bengali Song Lyrics written by Anupam Roy. Starring: Rudranil Ghosh, Sohini Sarkar, Ritwick Chakraborty, Anirban Bhattacharya, Riddhi Sen, and others. This Bangla Movie Directed by Srijit Mukherji. Music Mixing and Mastering by Shomi Chatterjee. এতো ছটফট করছো কেনো ? কি করতে আজ ইচ্ছে করছে, বলো কি চাও? প্রাণ ভরে নিঃশ্বাস নাও আজ তুমি দুচোখ বুজে..
শান্ত হও, শান্ত হও, শান্ত হও, শান্ত হও..
ধৈর্য্য হারিয়ে ফেলো না, ফেলো না..
Ki korte aaj icche korche bolo ki chao ? Praan bhore nishwash nao aaj tumi duchokh buje..
Dhoirjo hariye felo na, felo na..